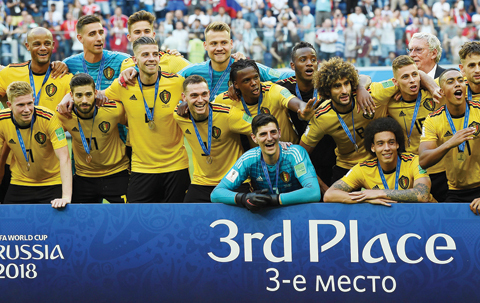 SAINT PETERSBURG: Belgium achieved their best World Cup finish as goals from Thomas Meunier and Eden Hazard secured a 2-0 victory over England in yesterday’s third-place playoff in Saint Petersburg. Meunier, who missed the semi-final loss to France due to suspension, scored after just four minutes before Hazard grabbed a late second as Belgium eclipsed the side that came fourth at the 1986 edition. Belgium have now defeated England twice in a fortnight, having waited 82 years to beat them before winning 1-0 in their group stage encounter. Gareth Southgate’s men were forced to settle for England’s joint best performance at a World Cup abroad, matching that of the 1990 generation. He made five changes to the team beaten 2-1 by Croatia in the last four, as England fielded their youngest World Cup line-up in history-with an average age of 25 years and 174 days. Phil Jones, Danny Rose, Eric Dier, Fabian Delph and Ruben Loftus-Cheek all came into the side, while Belgium boss Roberto Martinez recalled Meunier and handed a start to Youri Tielemans. Paris Saint-Germain defender Meunier made a quick impression by firing Belgium in front following an attack started by Romelu Lukaku. The Manchester United forward released Nacer Chadli down the right into space behind the England defence, and his cross was turned home by Meunier who stepped in front of a static Rose. Jordan Pickford readjusted his body superbly to deny Kevin De Bruyne a second time, the Everton goalkeeper clawing away the ball after a sizeable deflection off Kieran Trippier. Eden Hazard sought to exploit the spaces at every opportunity, the Belgium captain linked up intelligently with Tielemans on the edge of the area but was blocked off as he tried to pull the trigger. England slowly worked their way into the contest as Loftus-Cheek headed straight at Thibaut Courtois on 15 minutes. Harry Kane blew a terrific chance to add to his six goals in Russia, the favourite for the Golden Boot scuffing harmlessly wide after an inviting lay-off from Raheem Sterling. Toby Alderweireld, one of six Tottenham players on the pitch, then hooked just over after a mishit Tielemans shot dropped to the Belgium defender at a corner. Belgium lost Chadli to a hamstring injury before half-time, while Southgate introduced Marcus Rashford and Jesse Lingard at the break for Sterling and Rose. Their pace and directness gave England renewed vigour, with Lingard volleying across goal just out of the reach of a lunging Kane. They received a let-off when Lukaku failed to control a defence-splitting pass from De Bruyne, allowing Pickford to charge off his line to smother. And it looked as though Dier was going to draw England level when he lifted the ball over Courtois, only for Alderweireld to race back to clear off the line. With England pushing forward, Meunier nearly produced one of the goals of the tournament, his crisp volley from a Dries Mertens cross drawing an excellent one-handed stop from Pickford.